We have many low step vehicles for Passengers with special needs or elderly passengers. 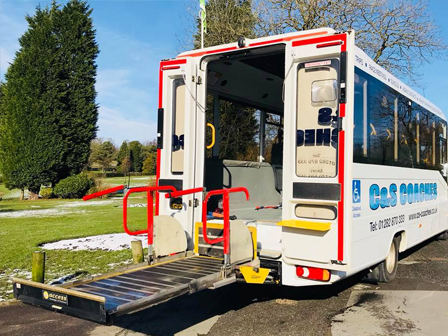 We have many that also include wheelchair lifts at the rear for either transferable passengers or clamped.
" After working for C & S Coaches for over 20 years and now retired, I would highly recommend them to anyone. They have high class coaches, first class drivers and the management team and office staff are brilliant. " " Just want to thank the staff at C & S Coaches. There fantastic and made my bookings all year brilliant. " " Just want to say thanks to Dave, helped us out when we needed it. 5 star service would use any time. " " Brilliant service from booking over the phone to the prompt and reliable driver and the bus were brilliant and clean and tidy. Thank you :) "
" What a fantastic company, booked for an airport pick up and drop off. VERY prompt! Even came back for us after our flight was delayed for 3 days. Lovely friendly driver as well. Would highly recommend. " Don't forget to follow us & get in touch. © Copyright 2014-2015 C & S Coaches All rights reserved.